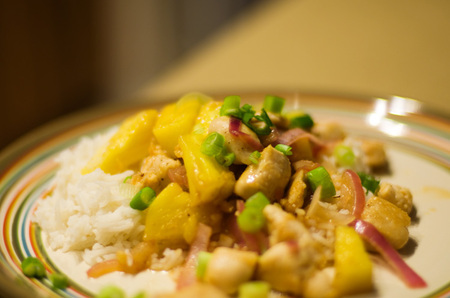 I hope you enjoy this Pineapple chicken recipe. Thier are a million different recipes for this dish, I can't say I have tried them all but this is the winner in my books. Funnily enough it is probably the simplist as well! These ingredients are enough to make about 6 servings. Chop the chiken into small bits and spread out in a large casarol dish. Sprinkle with salt, pepper, sugar and paprika. Slice the onion and spread out amongst the chicken. Mix the mustard, tobasco sauce, vinegar (or wine) cruched garlic, soy sauce and pineapple together and then spread evenly over the chicken. Cover with tin foil and cook for about 45 minutes on medium heat or untill the chicken is cooked evenly. Serve with fresh coriander or spring onion and serve with Basmati rice.